2Gillette is undoubtedly the biggest brand within the razor industry. Because of this, it can be really hard to keep up with all the new products and models that they release. They often use different names and variations of the same thing, with the main brand being the Gillette Fusion. There are many different variations of razors and shavers that use the Fusion brand, most recently the razor Fusion5. But is there a difference between the Fusion and Fusion5 models? Essentially, the Fusion5 is just an updated version of the original Gillette Fusion. The main upgrade that the Fusion5 received was a better lubricant strip added, as well as an improved anti irritant set of blades. So, there definitely was an upgrade when the Fusion5 was introduced as an alternative to the original Fusion. But was there that much of a difference, was there really a dramatic difference between the two? As someone who has used both models, I think I’m in a good position to compare the two. The reality is that there really isn’t much difference between the old Fusion blades and the new Fusion5 blades. The old Fusion blades also used 5 blades in their razors, which is one of the more popular amounts of blades that a lot of companies are using. Gillette typically use odd numbers of blades like 3 and 5, whereas other brands like Dorco and the Dollar Shave Club prefer to use either 4 or 6 blades. One thing that hasn’t changed with the Gillette Fusion is the expensive prices that they’re charging. To be fair, Gillette are expensive but so are many of the other brands that are currently on the market too. It’s becoming increasingly difficult to find brands that sell razor blades for less than a dollar each, even though we know the production costs are far less than that. As far as the Fusion blades themselves, they definitely get the job done but they’re not the best that you’re going to find on the market. There are other brands around which may suit you better than the Fusion, like Vikings Blade or even Bic, who were once known as the cheap joke of the disposable razor market and are now producing some decent quality razors. I do own the Gillette Fusion, but I don’t use it very often as I’ve moved onto using other razors. I do have friends that still use it religiously however, as it’s many guys starting razors when they enter into the shaving world. If you don’t like the Gillette Fusion, that doesn’t mean you need to ignore the Gillette brand entirely. 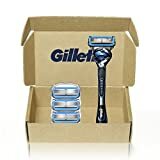 There are other Gillette products that you might want to consider, including the Gillette Sensor series. The reason I prefer the Fusion is because it’s better for shaving your head, but if you’re looking to shave your face, some people prefer the Sensor Excel. The reason that people may prefer the Sensor Excel is that the head pivot in the middle of the razor. This makes is much easier to shave areas like your neck, as you have the opportunity to get a more flexible shave. Another possible variation that you might want to consider of the Gillette Fusion is the Fusion5 Proshield. They’re specifically designed to help those that experience significant irritation, which is actually a far higher percentage of guys than you might think. The Proshield uses a protective mechanism like the lubrication strip on the standard Fusion5, but it surrounds the entire blade as opposed to just a strip. This makes it easier for you to shave, and makes it much less likely that you’re going to experience irritation when you’re shaving. Overall, the Fusion5 is a pretty standard razor that makes a good starter for most people. If you’re just looking to get into purchasing your first razor, then you can consider the Fusion5. But if you’ve been using razors for a while and you’re not afraid of investing a little extra, then you can definitely consider other razors as there are an abundance of different models available on the market. But, some people still swear by the Fusion and it’s definitely not a bad choice.